With a stay at Bali Mandira Beach Resort & Spa in Legian (Padma), you'll be steps from Legian Beach and 6 minutes by foot from Kuta Beach. This 4.5-star resort is 0.5 mi (0.8 km) from Double Six Beach and 1.9 mi (3 km) from Seminyak Beach. Make yourself at home in one of the 191 air-conditioned rooms featuring minibars and LCD televisions. Complimentary wireless Internet access keeps you connected, and satellite programming is available for your entertainment. Bathrooms have shower/tub combinations and hair dryers. Conveniences include phones, as well as safes and complimentary newspapers. Relax at the full-service spa, where you can enjoy massages, body treatments, and facials. You can take advantage of recreational amenities such as an outdoor pool, a waterslide, and a spa tub. Additional features at this resort include complimentary wireless Internet access, concierge services, and babysitting/childcare (surcharge). Grab a bite at one of the resort's 2 restaurants, or stay in and take advantage of the 24-hour room service. Relax with your favorite drink at the bar/lounge or the poolside bar. A complimentary buffet breakfast is served daily from 7 AM to 10:30 AM. 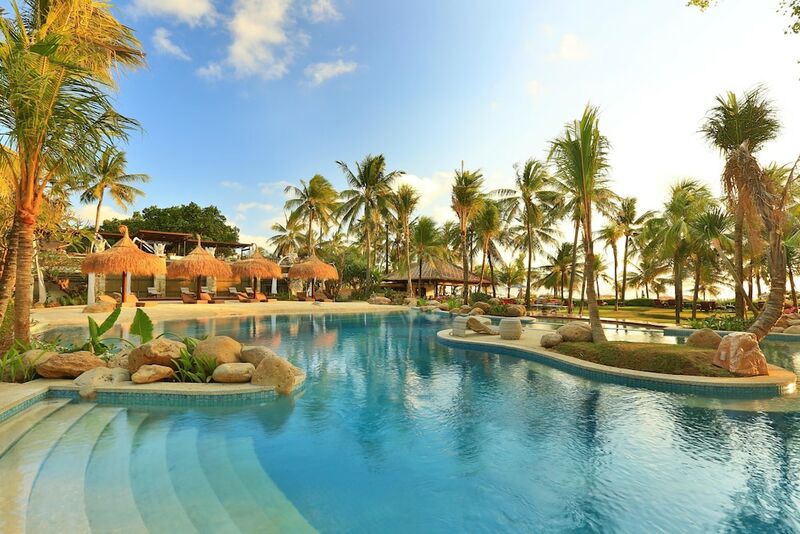 In addition to a full-service spa, Bali Mandira Beach Resort & Spa features a waterslide and an outdoor pool. Dining is available at one of the resort's 2 restaurants. Guests can unwind with a drink at one of the resort's bars, which include a poolside bar and a bar/lounge. Guests can enjoy a complimentary breakfast each morning. A computer station is located on site and wireless Internet access is complimentary. This luxury resort also offers a children's pool, a spa tub, and spa services. Complimentary self parking is available on site. Bali Mandira Beach Resort & Spa is a smoke-free property. An outdoor pool, a children's pool, and a spa tub are on site. Other recreational amenities include a waterslide. Guests can indulge in a pampering treatment at the resort's full-service spa. Services include hot stone massages, facials, body scrubs, and body treatments. The spa is equipped with a spa tub. A variety of treatment therapies are provided, including aromatherapy and reflexology.